Writing a to-do is just the beginning of the chores for me. It’s like the appetizer to the actual To Do, except that it’s not delicious. And forget about creating grocery shopping lists. That said, many people love making a nice list of tasks. This one tells it like it is: you’ve got crap to do and crap to buy. With it, you can divide and conquer crap by category, then check it off as you get it done. 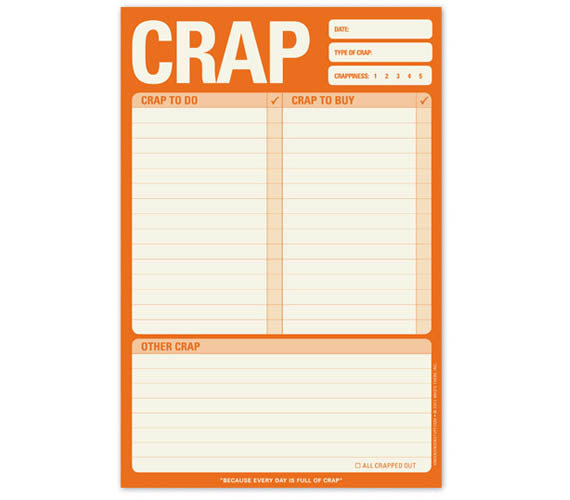 The pad includes 60 sheets and a handy crappiness scale so you know precisely how how crappy your day will be. Yay. I didn’t know they had this pad. I’ve been using the standard TO DO list pad for years. This one is sooo much more appropriate for my current situation. Thx!